ISLAMABAD: The National Assembly (NA) on Tuesday witnessed the introduction of five private members’ bills and rejected three pieces of legislation. 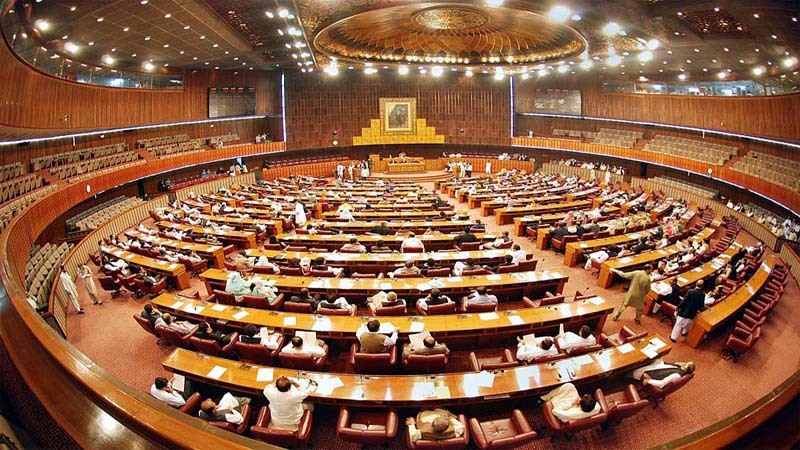 The house witnessed the introduction of five private members’ bills, including the Constitution (Amendment) Bill, 2018] (Articles 25B, 51, 63B, 92 and 106); the Pakistan Psychological Council Bill, 2018; the Elections (Amendment) Bill, 2018; the Legal Practitioners and Bar Councils (Amendment) Bill, 2018 and the Constitution (Amendment) Bill, 2018 (Articles 106). Three bills, including the Constitution (Amendment) Bill, 2018 (Article 37); the Constitution (Amendment) Bill, 2018 (Articles 51 and 59) and the National Centre for Countering Violent Extremism Bill, 2018, were rejected by the house. Two bills, including the Criminal Law (Amendment) Bill, 2018 (Section 489F) and the National Accountability Bureau (Amendment) Bill, 2018, were deferred. Two bills were withdrawn by their respective movers which were the Constitution (Amendment) Bill, 2018 (Article 198) and the Home Based Business Opportunities for Widows, Transwomen, Single and Disabled Women Bill, 2018.